Yes, another year and another handmade Christmas card! This year I purchased a little Cuttlebug Embosser because I love textured papers. I knew I would use it in my card. I combined die cut snow flakes, pop dots and embossing all in one! 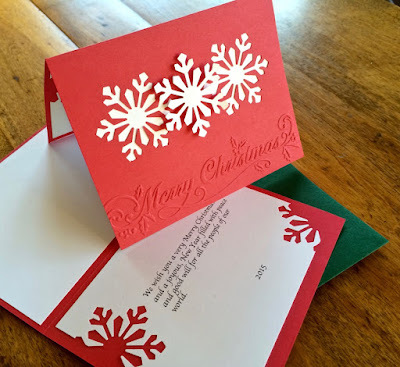 I used the embossing to add the Merry Christmas on the front. And I especially like how I carried the cover theme to the inside with the partial diet snow flakes along with the message. If you are thinking of getting an embosser, just pay attention on Amazon. I got this one at over 50% off but also watch the embossing folders. Some sell for $20 each. Others are just $2. I watch and wait and then buy the $2 ones! Same goes for the snowflake die. This is from Martha Stewart and I managed to get it at 50% off at Michaels. If you like handmade Christmas cards take some time and look through all the ones I have created over the years. Here are links to many. These started in 1984. Years before the internet and blogging! That is a lovely Christmas card and I like the the snowflakes on the inside too. Merry Christmas to you and your family.